My daughter had an upset stomach for the past few weeks and now she's finally recovered. She loves eating chicken and I wanted to make something healthy and with very little oil so it will be easier on her little tummy. Steamed dishes are always healthier than stir-fried dishes and after researching steamed chicken I found this recipe. 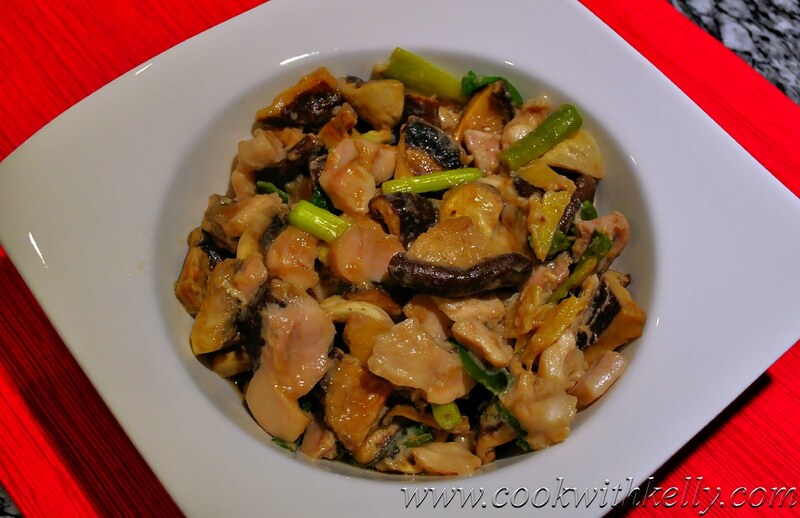 Originally, this recipe uses dried shiitake mushrooms, but I decided to use half shiitake mushrooms and half fresh mushrooms. Shiitake mushrooms have a unique flavor that goes very well with chicken and together with fresh white mushrooms give more freshness to this dish. It turned out perfect. My daughter, the picky eater, loved this dish so much that my husband and I had to save ours for her because she finished all the chicken and mushrooms so fast. This dish is very easy to make, after marinating the chicken all you need to do is steam it for 15 minutes and you are done! Soak the shiitake mushrooms 15 minutes before cooking. When the shiitake mushrooms are soaked, wash them with running water until the water is clear. Cut the shiitake mushrooms and white mushrooms in quarters. Cut the chicken legs into small cubes. Cut the green onion approximately 1.5 inch long. In a large bowl, add everything except the mushrooms. Mix everything evenly and let it marinate for 15 minutes. Add shiitake mushrooms and white mushrooms. Mix everything evenly. Transfer the bowl to a steamer, and then steam for 15 minutes. Now you are done. Enjoy while it's hot!